Seminole Lakes is located in south Punta Gorda, FL off of US 41 and 3 miles to I-75. It is situated on approximately 250 acres of land that offers low maintenance single family home living in a park-like setting. It is a much sought-after community that is gated and guarded 24/7. It is only a few minutes from downtown and historic Punta Gorda and Fishermen’s Village. Both offer fine shopping, dining, and spacious parks with vistas and wide open water as well as a bike and walking paths around the city. Seminole Lakes offers resort-style amenities such as an 18-hole executive semi-private golf course with pro shop, club house, restaurant, in-ground heated pool, fitness center, and clay and hard court tennis courts. The Tennis Center offers special clay court memberships and many tennis related activities during the year. There is a tiki hut at the pool where many activities are held. The exercise room, lending library and a small kitchen surround the community pool. The roads are paved and private. The community offers public water and sewer, underground utilities, tree-lined streets, wide sidewalks and street lamps. Golf membership is not required for Seminole Lakes’ residents. The 18-hole course features 4,525 yards of golf from the longest tees for a par of 62. The course rating is 60.7 and it has a slope rating of 95. 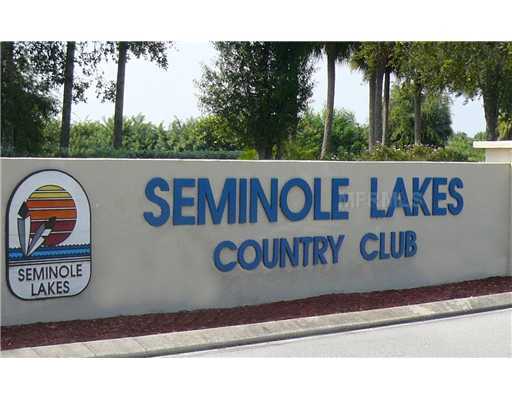 Information on Seminole Lakes Country Club can be obtained on their web site at: http://www.seminolelakes.net/index.htm. The clubhouse offers lunch and special events such as weddings and business meetings. The dining area seats up to 120 people and includes a dance floor. There is also a private dining area as well as a full service liquor bar and an outdoor covered seating area. This lively and idyllic community of just fewer than 500 well cared for homes offers single family homes in the price ranges of $157,000 to over $375,000. There are two to three bedroom models with lanais, garages and meticulously landscaped lawns. Some of the homes back up to one of the eight lakes or the golf course where you will see some of Florida’s most beautiful birds and wildlife. Many of the homes also offer a third car garage for parking your golf cart or a private pool in your own backyard. Residents often ride around the community in their golf carts. The homeowner association fee includes landscape mowing, the maintenance of private roads, the guard house and the community pool. The owner is responsible for shrubbery care. Seminole Lakes Property Owners Association is managed by Star Hospitality Management, Inc., 26530 Mallard Way, Punta Gorda, FL 33950. The office hours are Monday through Friday from 9am to 5pm. The office phone number is 941-575-6764. The email is star@sunletter.com. The homeowner association web site with the rules and regulations, by-laws, covenants, articles of incorporation, swimming pool rules, calendar of events, board meeting minutes, photos, and more can be found at: http://slccfl.com/. Contact a Realtor today so you can arrange to stop by for a visit and find out why so many residents have fallen in love with Seminole Lakes. You can view current listings by going to the local MLS at: http://myfloridahomesmls.com/. Tags: Seminole Lakes Golf Community Punta Gorda FL | Permalink.